We’d love your help. Let us know what’s wrong with this preview of Iron Lights by Felicity Banks. Emmeline Muchamore was respectable once. Her sweetheart, Matilda Newry, certainly put a stop to that. But when Emmeline gains magical insight into a disastrous future battle, she weaponises her wild reputation in order to draw trouble and death away from her adopted home ... risking everything and everyone she loves in the process. 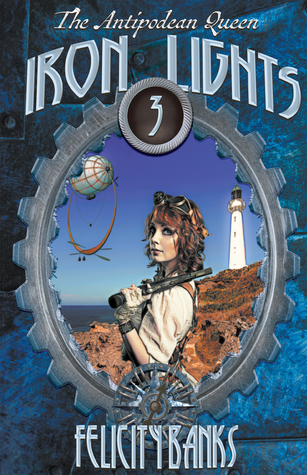 Iron Lights is a steam-powered tale of hon Emmeline Muchamore was respectable once. Her sweetheart, Matilda Newry, certainly put a stop to that. But when Emmeline gains magical insight into a disastrous future battle, she weaponises her wild reputation in order to draw trouble and death away from her adopted home ... risking everything and everyone she loves in the process. To ask other readers questions about Iron Lights, please sign up. Emmeline is a very appealing lead character, full of energy, optimism and conviction, and totally huma Iron Lights is the third book in Felicity Banks’ The Antipodean Queen trilogy and the next in the adventures of the series’ heroine, Emmeline Muchamore. Iron Lights, however, stands alone as a cohesive read and there is sufficient reference to key elements of the earlier works – mainly in terms of characters common to all three books – to orientate readers who have not read the first two books. This will be a short review, because it's of the third book in the series, and I always feel like people would find the reviews of the first - or even the second - book more useful. Also, everything I said in those reviews is true of Iron Lights (except that the back matter isn't a story in the style of Choose Your Own Adventure but a series of of letters from side characters in the main book). I really enjoy Emmaline as a main character. She's the sort of intellectually curious scientist and adv This will be a short review, because it's of the third book in the series, and I always feel like people would find the reviews of the first - or even the second - book more useful. Also, everything I said in those reviews is true of Iron Lights (except that the back matter isn't a story in the style of Choose Your Own Adventure but a series of of letters from side characters in the main book). I really enjoy Emmaline as a main character. She's the sort of intellectually curious scientist and adventer that I can't recall seeing much of in fiction (even if she does lean a little towards the "mad" variety of scientist, if I'm honest). She's also unfailingly polite; devoted to her sweetie, Matilda; and capable of coming up with the most harebrained schemes I think I've ever seen! I wonder if it's because she gets the science of things, but not necessarily the humanity of them. Seriously, some of her schemes in this book were never going to end well! I love the world that Iron Lights is set in, with its magically activated metals, clockwork soldiers and cyborg-ish creatures. I also love Banks's writing style. It's beautiful, and is a large part of how Emmeline's pure Britishness is conveyed. I'm always left wanting more, wishing the stories weren't quite so fast-paced, because I don't want them to end.